The Eton Wick History Group has been meeting regularly since 1992. Eton Wick and the surrounding area is rich in history and the village has a heritage dating back to 1217. Meetings are held at 7.30 pm in Eton Wick Hall, Eton Wick, and everyone is welcome. Refreshments are served, and there is a charge of £2.00 to cover costs. The Story of Oliver James Stannett in his own word - Starting Work. In 1915 when I was 12 my Mum and Dad applied for an exemption from school for me but we did not hear from the Education Board for over six months. When I was thirteen and a half I worked with Dad for about six months because we had pigs and another two acres of land on which we built a dozen pigsties. Dad used to collect swill from about twenty houses in the village and they agreed to have a joint of pork for Christmas instead of being paid for it. Dad used to kill two pigs for this purpose. He used to feed them up so as to make good joints. During wartime, he was only allowed to kill one pig for the family but someone had to split on him. So Dad went to see them (Ministry of Agriculture) and told them about all the children who had to have a joint. They told him that owing to his large family they would allow him two pigs but on no account must he kill more otherwise the Ministry would confiscate them. And, he must inform them every time they were being killed so that the Ministry could send an inspector to see that it was done properly. Who should come but a mate of Dad's so everything was O.K. and whoever came along and started asking questions would be shown the piece of paper from his pocket. One chap at Wick named Roland Bond, who was a builder at the time, told the inspector that if Stannett could kill two so could he. He did and was fined £100. We believe that he was the one who reported Dad in the first place. Anyway, we had two large policemen up at the allotment. We had a big tin bath that hung on the wall. When the pigs were killed I would fetch them in a wheelbarrow and lay them in the bath one at a time. Then we would pour boiling water over them and used tin lids to scrape the hair off. It was surprising how easily it came off. The chitterlings were done separately and I was the one who had to do them with a cane. After a thorough wash, they were threaded on to the cane, turned inside out and washed again. Mum always had one head to make brawn - it was beautiful stuff I am sorry that we can't get any like it today. Eventually, Dad had forty-two sows and two boars but because he was the only one paying rent he had to sell up because it was crown land. So I had to get a job. This is an extract from the autobiography written by Oliver James Stannett (1903 - 1988) and republished here with the kind permission of his relatives who still live in Eton Wick. The collection of Oliver Stannett's articles can be found by clicking on this link. It is to Antoine Pyron du Martre, best known by his adopted name of Mark Anthony Porny, that the parish has most reason to be grateful. He was born at Caen in Normandy, and came from France in 1754 when a young man of twenty-three. After a severe struggle to maintain himself, he settled down as French Master in Eton in 1773, and occupied this position for thirty-three years. It seems that about 1790, steps were taken by Provost Roberts to establish a Charity and Sunday School for the children of the parish. A committee of twenty-two was appointed and subscriptions were collected, which enabled the good work to be carried on in a small way from year to year. This was the first attempt, since the College was founded, to give the children of the poor a religious and elementary education, and Mark Anthony Porny was much interested in it; but few knew how great his interest was, or anticipated his noble intentions. It is, however, pleasant to learn that his worth of character was otherwise recognized, and that, towards the end of his life, he was appointed by George III. one of the Poor Knights of Windsor, and on his death in 1802 was buried on the south side of St. George's Chapel, where his grave is still to be seen with its Latin inscription. 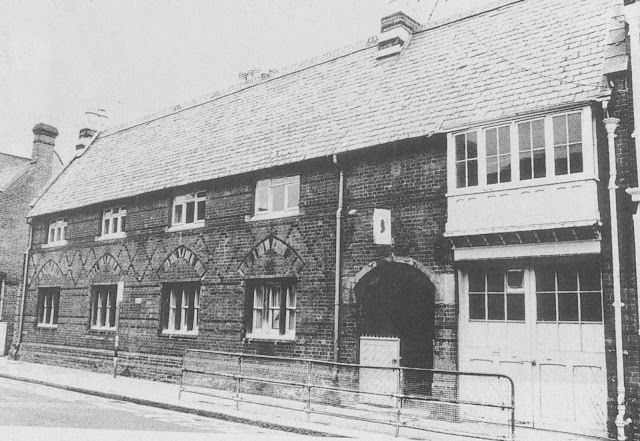 The ideas of suitable school accommodation were much more limited than in these times, but, in the local press of the day, they are described as " neat and convenient buildings, in conformity with plans submitted to the Court of Chancery." They were built by contract for £1723 by Mr. Tebbott of Windsor. The school was opened on April 26, 1813, the management of it being vested in the Provost and Fellows and eight other inhabitants of the parish, who were called Porny Trustees. The Porny Trustees used to meet on the first Tuesday in each month except during the holidays. Every Porny scholar who reached the age of 14, and left school with a good character, received a Bible and Prayer Book. 1 A board bearing an inscription is still over the archway leading to the Parish Room. 2 The school hours in those days were in summer 8 a.m. to 12 noon and 2 p.m. to 5 p.m., in winter 9 a.m. to 12 noon and 1.30 p.m. to 4 a.m. On Sunday's 8.30 a.m. and in the afternoon 2 p.m. to 5 p.m., or 6 p.m. in summer. This is an extract from Old Days of Eton Parish by The Rev. John Shephard originally published by Spottiswoode and Co., Ltd. in 1908. Read Arthur Mylam's memories of Eton Porny School here. The day of the fair' was indeed the big day of most rural communities before the ownership of family cars. Eton Wick was no exception, although until about 130 years ago the village was probably not large enough to support regular events. In 1878 some diverse social gatherings did take place and were considered worthy of recording. Firstly a political rally, and a steam circus, were held on the Common. I find this perhaps surprising, as at that time all villagers' were conscious of their Common's Rights and vehemently opposed any misuse. Again, a surprise that the small population was deemed adequate for a steam circus. Perhaps more importantly in 1878 Eton Wick held its first Horticultural Show, which predated the village recreation ground by several years; the allotments by 16 years and was 13 years before Eton Town's first Horticultural Show. Apart from war years the show became an annual event and with time, became ever more successful. By the 1930s it was the August Bank Holiday event held in Wheatbutts Orchard, often with a Guards' band; outdoor dancing, side shows; various pet classes on show: children's competitions of wildflowers, grass collection, mini gardens. needlework etc., and adult cookery entries of cakes, cooked vegetables, dinners etc. The allotment holders have revived the horticultural show in recent years but alas the days when every villager attended with enthusiasm have long since gone. We will now look at the biggest of them all, the Wicko! carnivals. held between 1967 - 1981, at how they came about, why they stopped and ask "could they have survived?' The origin was certainly unusual and indirectly came about following the end of the Eton Wick cricket club in the 1960s. The cricket club was long established; it played home matches at Saddocks Farm, had its own wood pavilion and regularly had very popular fixtures. Unfortunately, a possible move to the village recreation ground brought about the club's demise. They gave the mobile pavilion to the Eton Wick youth club, but unfortunately, village children burnt the building and the youth club duly claimed the insurance money of £600. At that time; and after ten years as the 'Club Leader' I was then its Chairman. The Adult Committee decided against a replacement pavilion but opted for a purpose-built Sports Hall to be built behind the Village Hall. The insurance money was inadequate so we decided to raise the money needed with a Recreation Ground based fete. The word 'fete' had been used by the scout movement and also the Village Hall in recent years so we settled on 'carnival'. That year of 1967 Canada had held an International Exhibition. logoed 'Expo! 67' so committee member Andy Skeels said we will call our carnival 'Wicko 67½'. Success came so we subsequently held 'Wicko 68'; 'Wicko 69' and so on. Publicity was pushed way beyond our locality and Mr. Jim Kinross of Manor Farm generously let us have the entire use of South Field as a free car park for the many hundreds of visitors at one event it was estimated a crowd in excess of 10,000 attended. Of course events in the arena cost money and being held in the recreation ground no admission charge was possible, so as with the car park the event was virtually free to those not wanting to spend. There were, of course, side shows: fairground stalls and continuous arena entertainment. including music by a Scottish pipe band. a Caribbean steel band and a military band. There were go-cart rides: ladies wrestling: boxing: piano smashing competitions (inter pubs). a lively mock American civil war performed by the Civil War Re-enactment Group plus regular beauty queens and fancy dress shows. Also every year expert tug-of-war competitions. Wicko! attracted tug-of-war teams from far and wide - the midlands, west country and the London districts. With no experience of tug-of-war we were much indebted to the long-established Holyport organiser, Mr Charlie Aldridge, who guided us through the necessary 'know how' We were able to offer more attractive prizes to the teams through the good offices of Mr Stout, a villager who at that time had a substantial Reading based business trading suitably priced chinaware. Like other village ladies my sisters had spent months knitting saleable items and later making cakes and jams. All these village happenings need keen workers and it is no use dreaming up ideas without the will to execute them. Could Wicko! have survived? I have always thought it may, but probably depended on a more positive initial approach. I always had the old village pre-war shows in my mind and when planning the first Wicko! I asked Mr Harry Cook, who organised the annual Horticultural Show, If they would combine with Wicko! for a Recreation Ground annual event and in return Wicko! would guarantee the marquee and prize expenses of the allotment event. Harry decided to keep his independence, for which I could appreciate. However, if it had joined with Wicko! there would have been permanence to the show that the 'quick fix' need for money may not have brought about the early demise. Incidentally, in 1969 the Sports Hall and Wicko! Carnival were opened by the British Heavyweight Boxing Champion 'Billy Walker'. He also judged the many young ladies' Beauty Queen Competition. He chose Susan Lund as the 'Queen' and Kathy Reader as runner-up. Both girls lived in Princes Close, and eleven youth organisations had girl entrants. Some years later both Susan and Kathy were married to the village twin brothers. Tony and Terry Skeels, who were, in fact, the sons of Andy Skeels who had given the first Wicko! its name. Footnote: To further the family connection, Susan is the Great Niece of Ernie Brown: the 22 year old remembered on the Village War Memorial. Click here to read Our Village August 2011.